Black and white photograph of a female spinning operator at working at M.P. Stonehouse in Albion Mills in Wakefield in 1983. M.P. Stonehouse was worsted spinner founded in 1853 by Mathew Porritt Stonehouse and was based at Albion Mills in Wakefield. 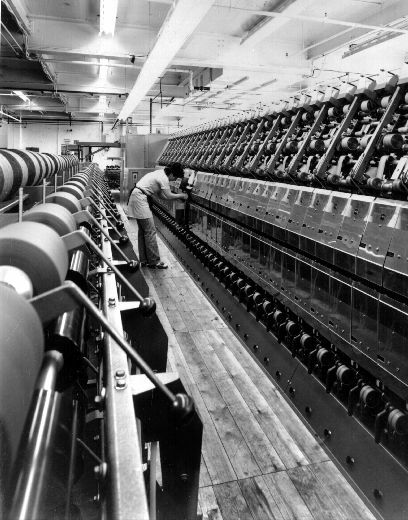 The factory’s main focus was carding and spinning uncombed worsted yarn for carpets and for hand-knitting. Spinning operators at M.P. Stonehouse in 1983.